We're heading into the realm of storybook fantasy with this week's Lighting Breakdown that blends natural and artificial light. 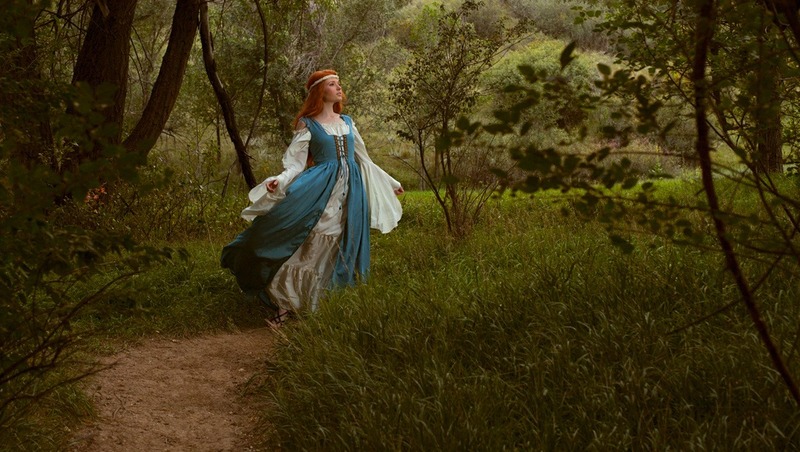 What could be better than a lovely, red-haired lady in a blue dress surrounded by a lush, green forest? A beautifully lit lovely, red-haired lady in a blue dress surrounded by a lush, green forest. Ahh, when light and color contrast meet, magic can happen! This was a combination of luck meeting good planning. I scouted this location, a park about a mile from my house, and knew that I wanted to shoot here during late afternoon or early evening, because the sun would be coming from just behind the mountains and back-lighting everything, which is a favorite scenario of mine. The day we created this set, there were thunderstorms all morning, and only near 4 pm, our scheduled shoot time, did the sun come peeping out from behind the clouds. 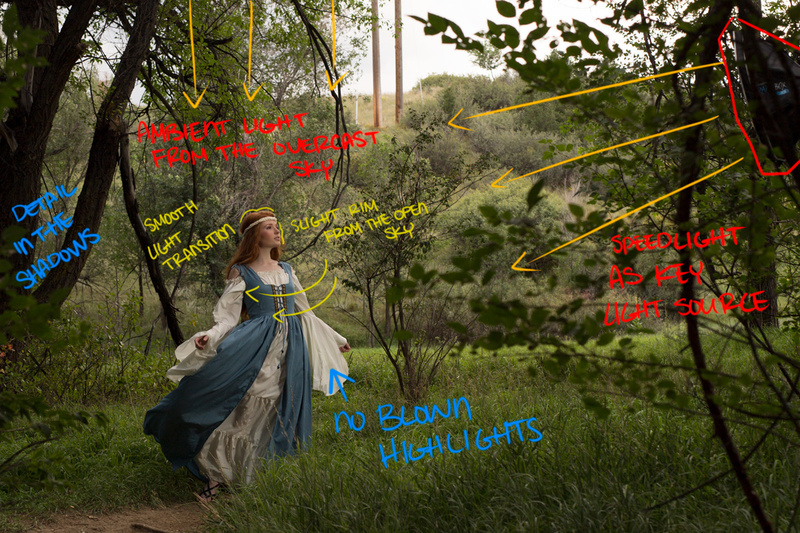 I'd decided on this location because it had a dirt path that was believable for the time period of the costume, and there was a field behind it, which would allow plenty of natural light to stream in through the back while being filtered by the trees overhead. Because I planned to use the back light, I made sure to bring my trusty Westcott Rapid Box and my speedlight, because I wanted to be able to balance the exposure. Where we lucked out in this scenario was that the sun was moving back and forth from being behind the clouds, so I ended up with a nice, big, soft light source that created depth without drowning the scene in too much light. It was important to me to get enough light on the lovely model, Miss Naomi Mullins, so that she would stand out from her surroundings, but not so much that the light looked too artificial — purposeful, but not over-lit. I dragged my oldest son with me on this shoot and turned him into a grip. You can see by the breakdown shot that he was standing just off camera with the light stand. To make this shot work the way I wanted it to, I needed to keep the exposure open enough to keep detail in the shadows, but not so much that the highlights in the foliage distracted from the model, and then add the flash so that it blended well. I positioned my grip so that the light was far enough away to give me a nice spread and fall-off that would suit the ambient light conditions and from a direction that wasn't counter to the light direction already present. As soon as the sun slid behind a veil of thin clouds, we went to work. Rather than adjust the power of the flash, I had the grip turn the light stand very slightly toward me to feather the light just a bit and keep the strength of the light hitting the model suitable to the ambient light conditions. Because the light modifier gives a good amount of control over the spill, it let me light the model without lighting her surroundings in a way that would distract the eye. The resulting image feels almost cinematic, like she walked from the pages of a story book, where the light makes the model the clear subject of the photograph but not in a way that detracts from the scene as a whole. A bit of color grading and a suitable crop were all that was needed to give this photo exactly the look I was hoping for. That's it for this week's lighting breakdown. Let me know if you've used a set up like this one, what you thought of it, what you think of the Lighting Breakdown series so far or if you have any suggestions for future breakdown articles! Do you ever find that you need to gel the flash to match color temp? Fun article! Always nice to see how others light their shots. 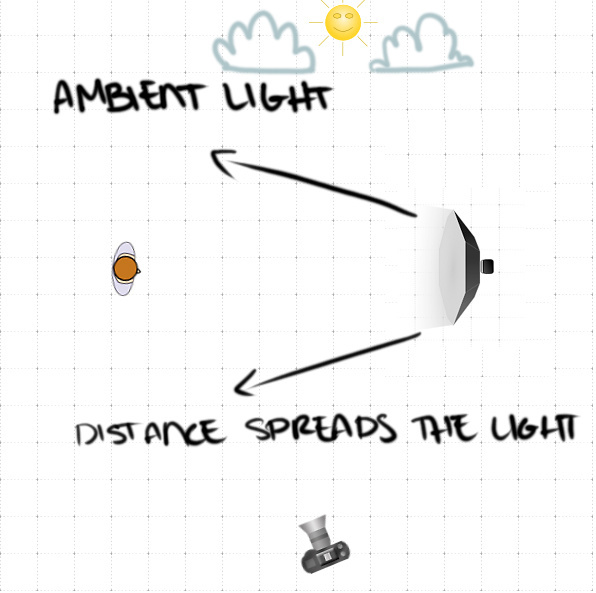 Do correct me if I am wrong, I get the idea behind getting "more spread" with a light by placing it further, but... that's not how light works. By placing the light further away, the relative size of the light gets smaller, and in turn, results in harsher shadows. End result looks great though, so whatever works! I think idea here is to get even light across the body, not get the softest light possible. Thats so informative! I like that kind of article. Thanks!